The Office of Enterprise Technology Services’ Cyber Security Program is led by State Chief Information Security Officer, Vincent Hoang, who is responsible for securing State government information resources and infrastructure. He brings 20 years’ experience in developing and implementing effective information technology strategies, including the application of cybersecurity, network management, and systems design to improve business outcomes. 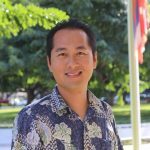 Mr. Hoang most recently served as the enterprise architect for Hawaiian Telcom, where he secured infrastructure for customers and conducted network architecture, performance, security risk, and systems infrastructure assessments. He also worked as a senior systems consultant for Bank of Hawaii and a security engineer for Munger, Tolles and Olson in Los Angeles. Mr. Hoang holds a wide variety of technical competencies and is a Certified Information Systems Security Professional (CISSP), Global Information Assurance Certification (GIAC) Systems and Network Auditor (GSNA), Certified Information Security Manager (CISM) and Systems Auditor (CISA), Cisco Certified Design Professional (CCDP) and Associate (CCDA), and Cisco Certified Network Professional (CCNP) and Associate (CCNA). ETS’ cyber security program provides solutions and services that protect and preserve the confidentiality, integrity, and availability of electronic information resources critical to the Executive Branch of the State of Hawaii.